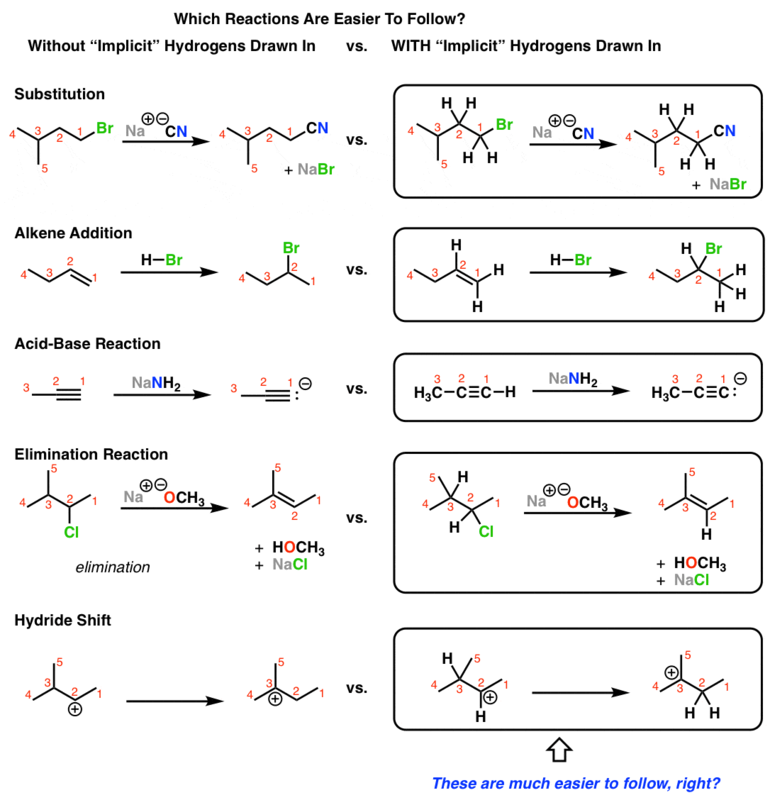 With regards to hidden hydrogens, don’t forget “Grossman’s Rule” (named by Robert Grossman in his “Art of Writing Reasonable Organic Reaction Mechanisms” book) which basically says “When you’re stuck, draw in the implicit hydrogens near the reactive sites”. It’s amazingly effective, especially when students first encounter acid mediated reactions (like 1,2-shifts) where they may forget there’s a hydrogen that can move. Then three more people chimed in on how useful Grossman’s rule was. So I dug out my copy of Grossman’s book, “The Art of Writing Reasonable Organic Reaction Mechanisms“. There is is, on page 1. Common error alert! : Don’t lose track of the undrawn H atoms… I have formulated what I modestly call Grossman’s rule: Always draw all bonds and all hydrogen atoms near the reactive centers. The small investment in time required to draw the H atoms will pay huge dividends in your ability to draw the mechanism. He then gives this example. I bought the book during a time in my life where I was, let’s just say, extreeeemely busy, and didn’t take the time to read it until now. Grossman’s book has a lot of value and there’s plenty of other gems to pull out of it. What I like most about the philosophy of the book is that it makes the distinction between the goal of having students write “reasonable” reaction mechanisms – reactions that are plausible – and writing reaction mechanisms that are “correct” (i.e. fully consistent with experiment). After all, you have to learn what a “reasonable” organic reaction mechanism is before you can go forward with the business of trying to design an experiment to disprove it. I’m going to be more clear with this point going forward. The book gets way beyond introductory course material, but chapters 1 and 2 are a great overview of the common mechanisms in Org 1/Org 2, and there’s plenty of useful “common error alerts” which have sage advice for the beginning student. Thanks to Stewie, Texas Carbon, Adam and Chemjobber for bringing this to my attention. Yep, there’s a lot – I could write about a dozen blog posts just based on the first chapter alone. I love the “common error alerts”. I was one of the lucky ones to be part of Grossman’s Organic chemistry course that taught writing reasonable reaction mechanisms at the University of Kentucky. Back then, the book was called ‘class notes’ which were freely available on his website. However, I have bought both editions of his book and have recommended it to countless others as one of the finest books to invest in, if one really wants to learn how to write ‘reasonable’ reaction mechanisms. I am currently using the book as a guideline to teach a course on writing mechanisms to lab chemists at a company I consult at. I hope he comes out with a third edition. The problem sets are a treat for organic chemistry geeks.